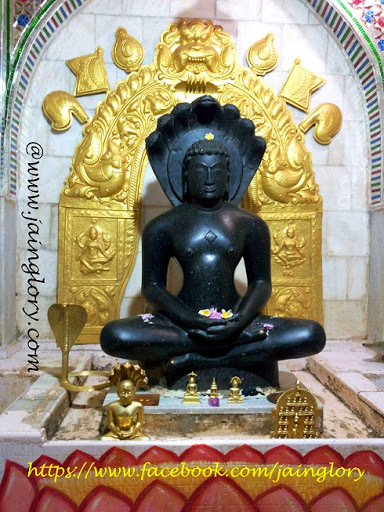 Jainism flourished in north eastern Karnataka during reign of Chalukya of Kalyani during 10th to 13th century AD. Modern Gulbarga, Yadgir and Bidar districts were once under sovereignty of Chalukya of Kalyani. Ancient Kalyani city was capital of Chalukyas and in modern time the place is known as Basav Kalyan. Jainism flourished under reign of Tribhuvnmalla Vikramaditya VI greatly. He was also supporter of Jainism and some of his feudatories, ministers and chieftains were ardent follower of Jainism. He reigned from 1076 to 1126 AD which is a vast time span therefore most of inscriptions are hailed from his era. Kamthan :- The place named Kamthan is a very ancient pilgrimage center in Bidar district of Karnataka state. The pilgrimage is situated about 10 Kilometers from Bidar district headquarter. In other words we can say that it is situated at suburb of Bidar which is named as Kamthana. Kamthana is situated about 45 Kilometers from Humnabaad in north-east direction where it is about 47 kilometers from Zaheerabad in north-west direction. Kamthan is renowned for 11th century image of 23rd lord Parshwanatha. The main temple is situated in a premise of about 1.5 acre. The premise of the temple has two gates in south and east direction. The temple has a Maanstambh of about 35 feet in front of main entrance to the temple. After entrance to the main temple a porch is there and the 4-5 flying stairs leads us to the main Garbhabriha. Garbhagriha has pradikkshna-path around the main vedi of temple. The image of Lord Parshwanatha was situated earlier in basement type structure but in 1989 AD the image of Parshwanatha was installed on new vedi at upper floor. Parshwantha image :- The image of Lord Parshwanatha is sculpted in black stone and belongs to 11th century AD. The height of image is about 4.5 feet and it is depicted meditating in Padmasana posture. The sculpture of Jina is very mesmeric and has expressions of serenity and tranquility on face. The main vedi is decorated with golden and glass work. Astha-pratiharya of Jina is carved in a metal which renders a feeling of golden work. Besides this main temple there are three Charan Chatri of librated Acharyas in garden. A vedi is also there in shikhra on top floor of the main temple. This vedi contains good glass work and an image of lord Parshwantha. The temple has an assembly hall of capacity of 200 on the name of Acharya Shri 108 Shrut Sagar ji and a memorial hall on the name of Acharya Shri 108 Aryanandi. The temple has good boarding facility for pilgrims and there are two borewell and a conventional well for water supply to temple and pilgrims. Jain Acharyas, munis and pilgrims often visit to this place and the place is considered very sacred in pilgrims especially from Karnataka, Telangana, Andhra and Maharashtra. Every year on an auspicious day a fair is organized and pilgrims visit in mass.